They say it’s the most wonderful time of the year. The snow is falling, the coffee’s hot and everyone’s looking forward to the big day. 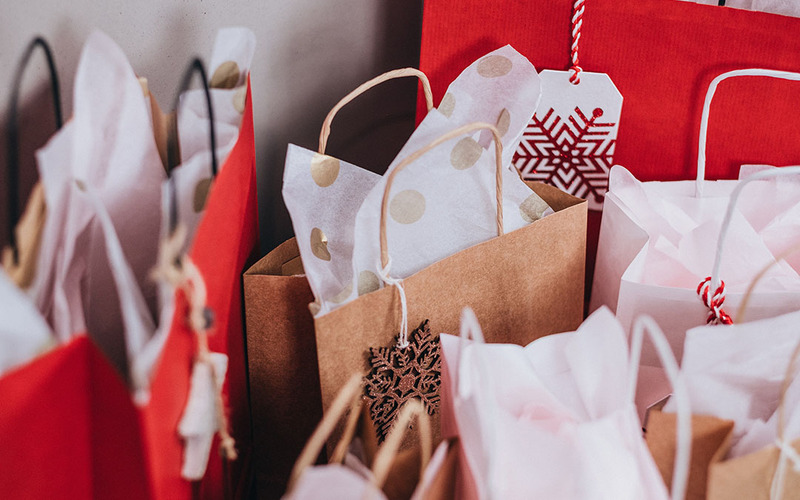 Businesses have their holiday gift packaging lined up, and as a master of gift-giving, you’re probably thinking about yours, too. The thing is, picking up wrapping paper and tape from the mall means your gifts look like everyone else’s. But having some fun with readily-available packaging supplies will give your holiday gifts the edge they deserve. Here’s 4 festive packaging options we think you gift-giving gurus will love for your holiday gift packaging. There’s a reason boxes are so widely used. Just like the wheel, they’re brilliantly simple and effective. Folded and taped, they’re supportive, easy to pack, and efficient to ship. But when you’re assembling gifts for family and friends, who wants to spend the time building and taping corrugated boxes? Enter apparel boxes and gift boxes. Made from sturdy chipboard, they’re designed for fold-out assembly in seconds—and can be closed just as quickly. They’re better looking than thick, heavily taped corrugated boxes, and accommodate clothing, books and small gifts perfectly. Use crinkle paper or tissue paper to properly protect and present your gifts inside. You’re winning this holiday season! We’ve all hit that point: the end of the holiday season approaches and we just can’t bring ourselves to wrap another box. So, we grab a few gift bags, drop in some gifts and top it off with a bunch of tissue paper sheets. It’s quick and easy, headache-free, and—honestly—can look better than a wrapped-up apparel box. But the thing about gift bags is their patterns can be terrible, and the laminated paper or plastic they’re made of isn’t exactly great for the environment. That’s where paper shopping bags can pick up the slack. Basic white, natural-looking kraft, and a bunch of colours and sizes makes them ideal for simple, attractive gift giving. Pair them with some nice contrasting or complimentary tissue paper colours and you’ve got a holiday gift packaging strategy that can’t be beat. It’s funny: apparel boxes and gift boxes are designed to make the packing and gifting of items easier. And then in walks the idea of gift bags, with their disdain for tape and their love for tissue paper, instantly declaring those apparel boxes and gift boxes to be “over.” And now, glamour mailers are on the scene, flipping their hair proudly and declaring gift bags to be suddenly last season. They’re an unexpected choice for holiday gift packaging, that’s for sure. Perfect for flat or narrow items like books, other media, and even clothing, glamour mailers shine bright and pack up easy. Dropping in a gift is quick, and all it takes is a pull of the peel-and-seal adhesive strip and it can be closed with minimal effort. Who needs boxes and tape and bags and filler? A super-shiny, eye-catching and totally surprising glamour mailer does the trick just as well. Now this is the stuff! It’s another layer of tension and anticipation, adding a few seconds to the time between opening gift boxes and retrieving the awesome things inside. Its colour choices are vibrant and attractive, it feels great to touch, and the crinkly sound it makes is truly unmatched. Whether you wrap it around gifts or stuff sheets of it into paper shopping bags, tissue paper’s got style and flair other holiday gift packaging would be hard-pressed to match. Okay, I know I said tissue paper’s the stuff. But custom tissue paper is THE stuff. Imagine a sweet pattern (Christmas or otherwise) designed by you and emblazoned across a sheet of super soft tissue paper. Put your name on it, or use a funny quote you’re known to say—do it in big bold letters, too—and you’ll ensure every single one of your family and friends knows that gift is from you. I must admit, I’ve been known to use MERRY CHRIS-MAS on my holiday gift packaging. Punny, sure, but everybody loves it! Packaging supplies are a wonderful, versatile thing. Whether they’re used in customer orders or for personal gifts, business owners and masters of gift giving rest easy knowing their precious items are protected and presented well. These options for holiday gift packaging have the potential for some smart and fun gift giving, creating unboxing experiences that are personal and heartfelt.